(click image to enlarge)The lack of display and LAN features mirrors the limitations of the i.MX6 ULZ, which NXP refers to as a “cost-effective Linux processor.” The headless, up to 900 MHz Cortex-A7 ULZ SoC offers most of the I/O of the of the i.MX6 UL/ULL, including ESAI, S/PDIF, and 3x I2S audio interfaces, but it lacks features such as the 2D Pixel acceleration engine and Ethernet controllers. 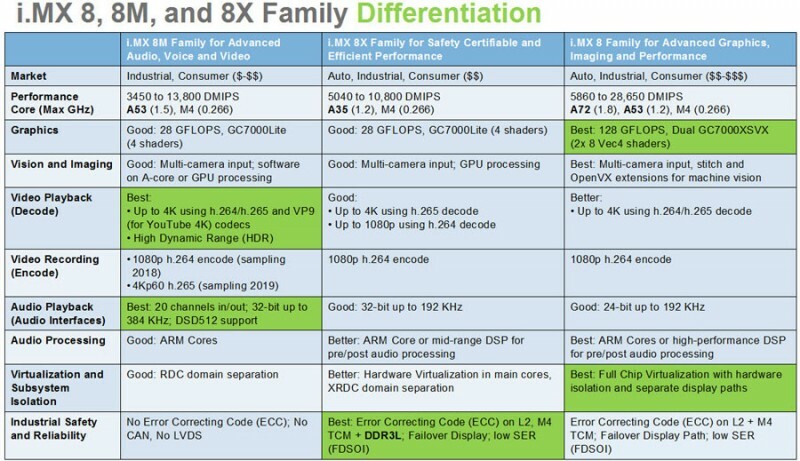 (click image to enlarge)Last year, Variscite spun the Linux-ready DART-6UL into a faster, 696MHz v1.2 upgrade, which added the option of NXP’s power-efficient i.MX6 ULL SoC in addition to the i.MX6 UL. A few months later, it followed up with a DART-6UL-5G model that boasts an on-board, “certified” WiFi/Bluetooth module with dual-band, 2.4 GHz/ 5 GHz 802.11ac/a/b/g/n. 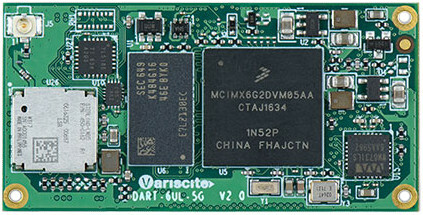 (click images to enlarge)The upcoming i.MX6 ULZ based version, which we imagine Variscite will dub the DART-6ULZ, has the same Wi-Fi-ac module with Bluetooth 4.2 BLE. Like the latest versions of the other DART-6UL modules, the module can be clocked to 900 MHz. 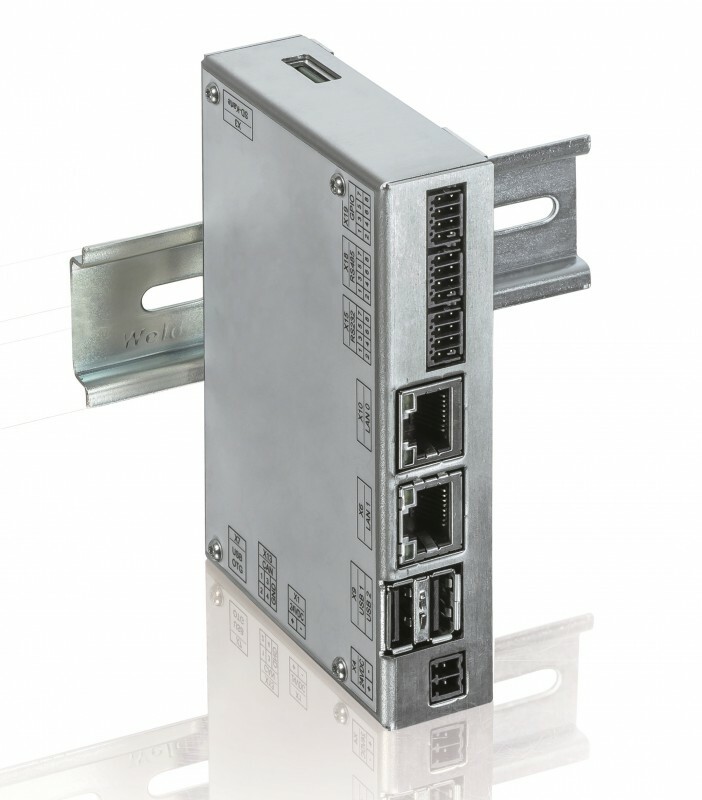 The new module is also limited to a 0 to 85°C range instead of being available in 0 to 70°C or -40 to 85°C versions. 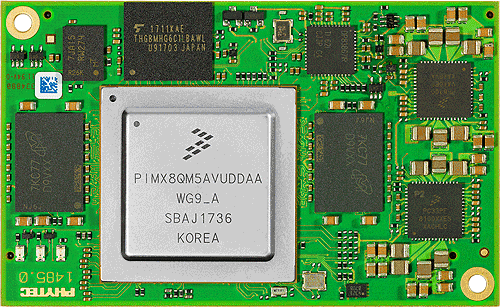 The i.MX6 ULZ SoC itself has a slightly wider range of 0 to 95°C. 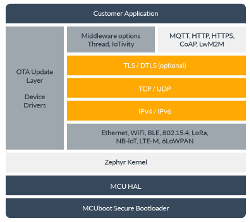 The pin compatible DART-6UL with iMX6 ULZ will offer the i.MX6 ULZ SoC with “optional security features,” which include TRNG, AES crypto engine, and secure boot. The 50 mm x 25mm module will ship with 512MB DDR3L, which was the previous maximum of the now up to 1 GB RAM DART-6UL. The storage range is similar, with a choice 512 MB NAND and up to 64 GB eMMC. 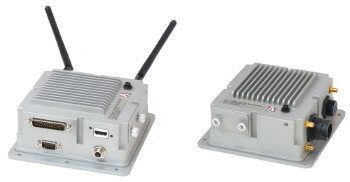 The ULZ version of the DART-6UL will support existing development kits, which are based on the VAR-6ULCustomBoard. 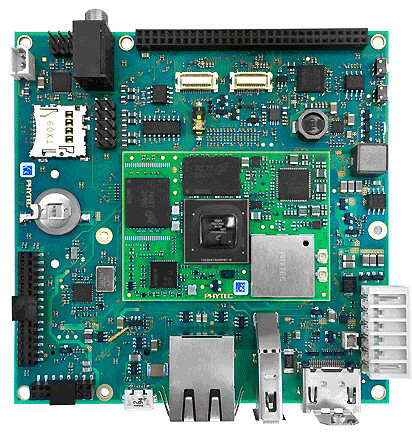 This 100 mm x 70 mm x 20 mm carrier board offers a microSD slot, a USB host port, and micro-USB OTG and debug ports, as well as features that are inaccessible to the ULZ, including dual GbE, RGB, LVDS, CAN and camera interfaces. 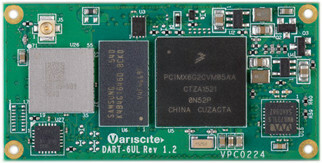 This week Variscite announced another DART module based on another new NXP SoC. 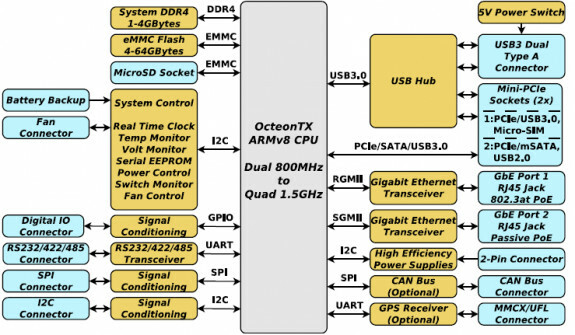 The DART-MX8M-Mini module taps a 14nm-fabricated i.MX8M Mini SoC variant of the i.MX8M with one to four 2GHz Cortex-A53 cores and a 400 MHz Cortex-M4, plus scaled down 1080p video via MIPI-DSI. 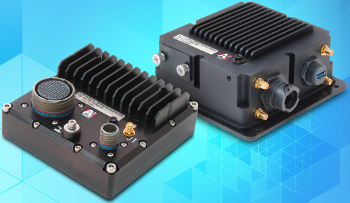 The DART-6UL with iMX6 ULZ will be available in the fourth quarter. The DART-6UL/ULL/ULZ product page notes that the lowest, volume-discounted price is $24, which likely pertains to the ULZ part. More information may be found in Variscite’s announcement. 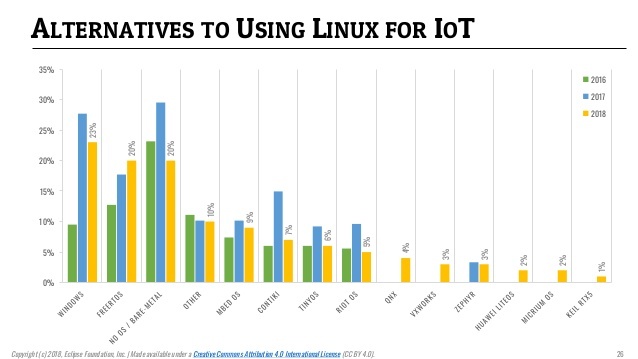 This article originally appeared on LinuxGizmos.com on September 19. 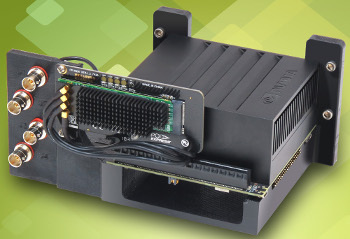 Phytec has posted product pages for three PhyCore modules, all of which support Linux and offer a -40°C to 85°C temperature range. 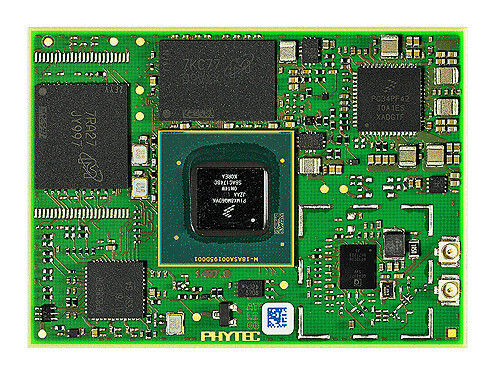 The three modules, which employ three different flavors of i.MX8, include a phyCORE-i.MX 8X COM, which is the first product we’ve seen that uses the dual- or quad-core Cortex-A35 i.MX8X. The phyCORE-i.MX 8 taps the high-end, hexa-core -A72 and -A53 i.MX8, including the i.MX8 QuadMax. 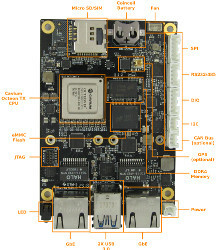 The phyCORE-i.MX 8M, which uses the more widely deployed dual- or quad-core i.MX8M, is the only module that appears as part of an announced SBC: the sandwich-style phyBoard-Polaris SBC (shown). The phyCORE-i.MX 8 will also eventually appear on an unnamed, crowd-sourced Pico-ITX SBC. 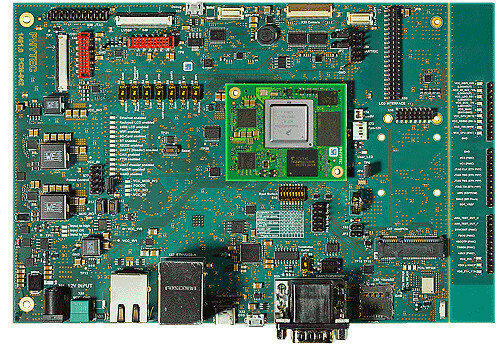 Development-only carrier boards will be available for the phyCORE-i.MX 8X and phyCORE-i.MX 8. 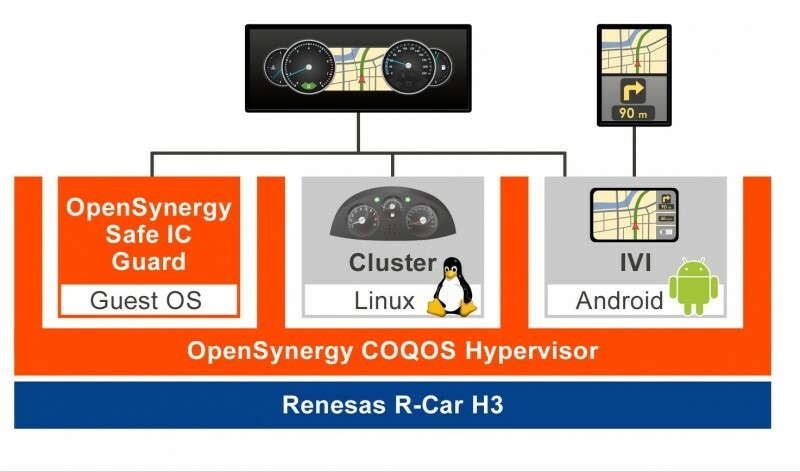 Evaluation kits based on the carrier boards and the phyBoard-Polaris will include BSPs with a Yocto Project based Linux distribution “with pre-installed and configured packages such as QT-Libs, OpenGL and Python.” Android is also available, and QNX, FreeRTOS and other OSes are available on request. BSP documentation will include a hardware manual, quickstart instructions, application guides, and software and application examples. 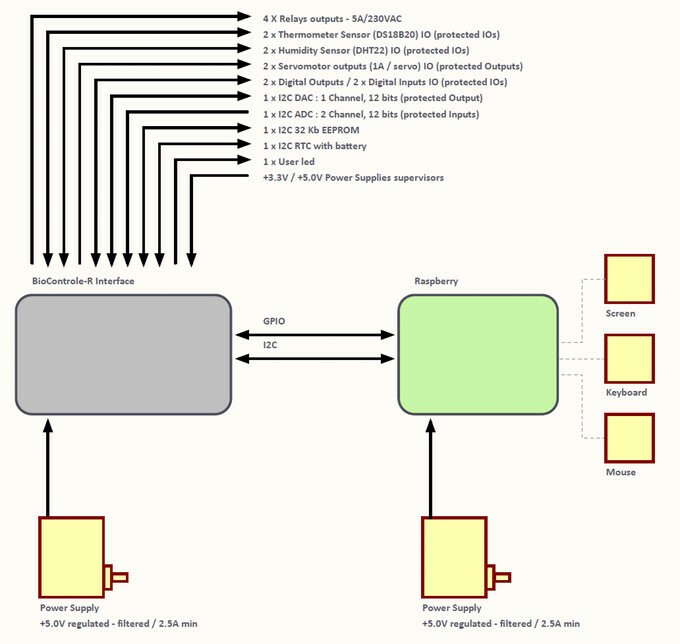 The three modules are here presented in order of ascending processing power. 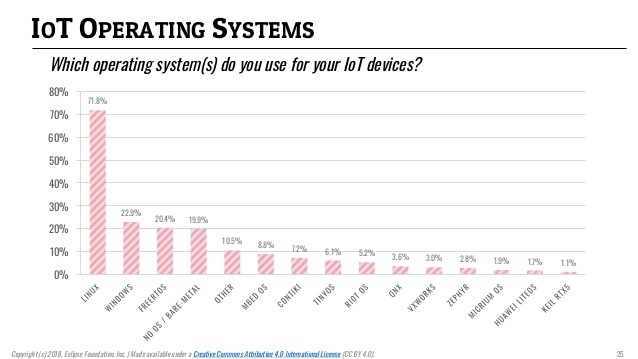 The i.MX8X SoC found on the petite phyCORE-i.MX 8X module was announced with other i.MX8 processors in Oct. 2016 and was more fully revealed in Mar. 2017. 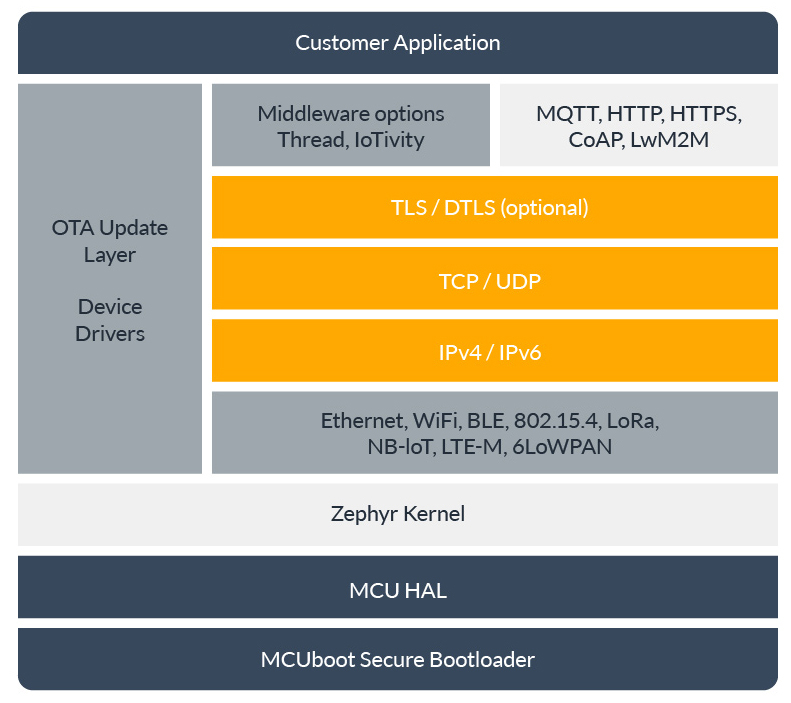 The industrial IoT focused i.MX8X includes up to 4x cores that comply with Arm’s rarely used Cortex-A35 successor to the Cortex-A7 design. 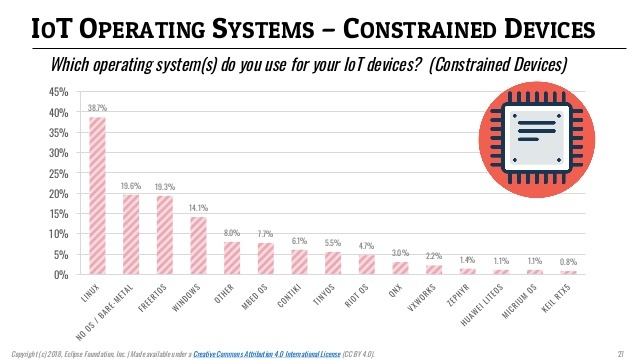 The 28 nm fabricated, ARMv8 Cortex-A35 cores are claimed to draw about 33 percent less power per core and occupy 25 percent less silicon area than Cortex-A53. 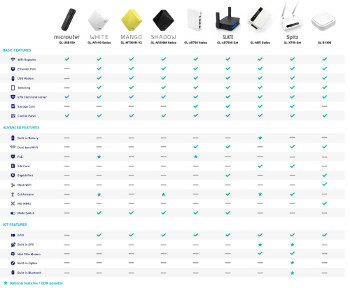 Phytec’s comparison chart shows the i.MX8X with 5,040 to 10,800 DMIPS performance, which is surprisingly similar to the 3,450 to 13,800 range provided by the Cortex-A53 based i.MX8M (see above).The i.MX8X SoC is further equipped with a single Cortex-M4 microcontroller, a Tensilica HiFi 4 DSP, and a multi-format VPU that supports up to 4K playback and HD encode. 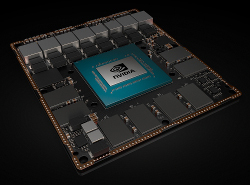 It uses the same Vivante GC7000Lite GPU found on the i.MX8M, with up to 28 GFLOPS. The i.MX8X features ECC memory support, reduced soft-error-rate (SER) technology, hardware virtualization, and other industrial and automotive safety related features. Crypto features listed for the phyCore-i.MX 8X COM include AES, 3DES, RSA, ECC Ciphers, SHA1/256, and TRNG. Phytec’s 52 mm x 42 mm phyCore-i.MX 8X is only slightly larger than the i.MX7-based PhyCore-i.MX7, but the layout is different. 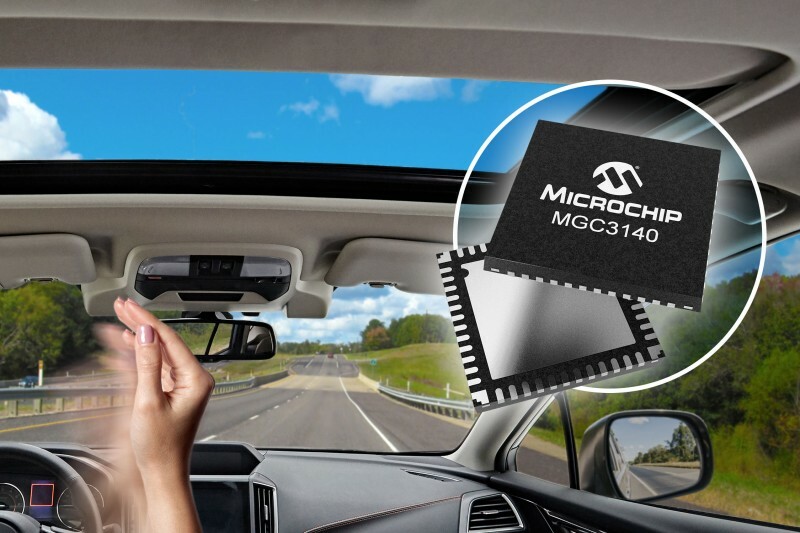 The module supports all three i.MX8X models: the quad-core i.MX8 QuadXPlus and the dual-core i.MX8 DualXPlus and i.MX8 DualX, all of which can clock up to 1.2 GHz. The DualX model differs in that it has a 2-shader instead of 4-shader Vivante GPU. The phyCore-i.MX 8X offers a smorgasbord of memories. 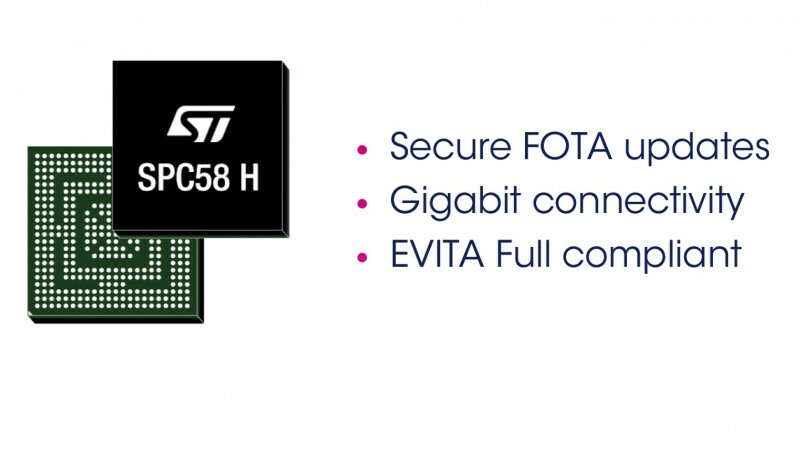 In addition to the “128 kB multimedia,” and “64 kB Secure” found on the i.MX8X itself, the module can be ordered with 512 MB to 4 GB of LPDDR4 RAM and 64 MB to 256 MB of Micron Octal SPI/DualSPI flash. 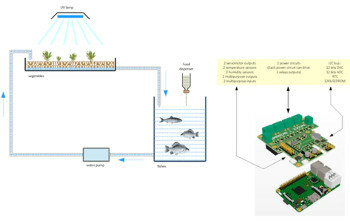 (Phytec notes that it is an official member of Micron’s Xccela consortium.) You can choose between 128 MB to 1 GB NAND flash or 4GB to 128 GB eMMC. 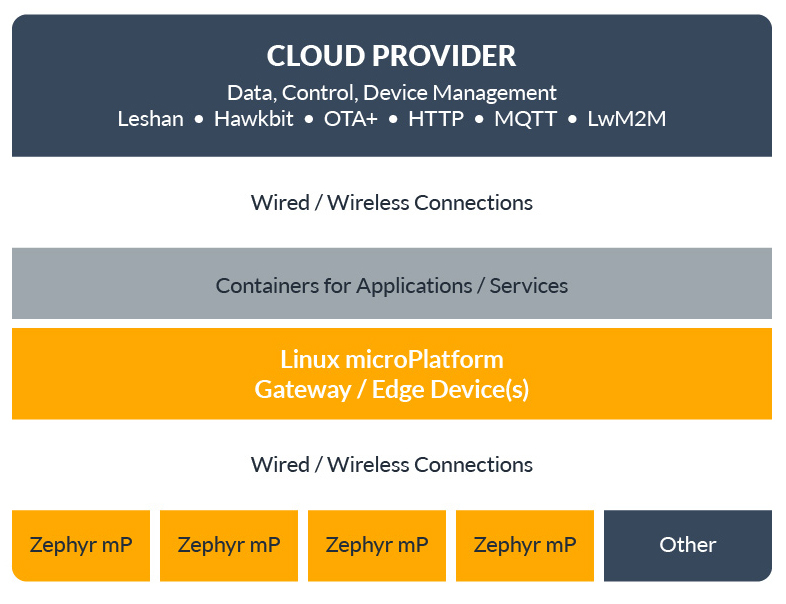 There’s no onboard wireless, but you get dual GbE controllers (1x onboard, 1x RGMII). 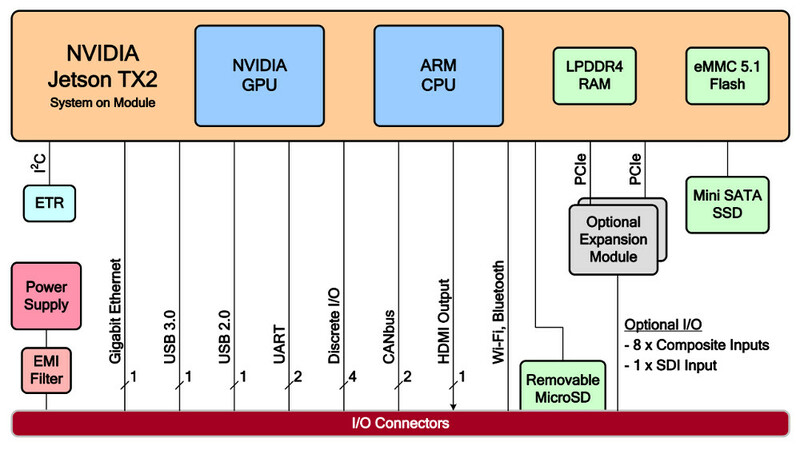 You can choose between 2x LVDS and 2x MIPI-DSI. 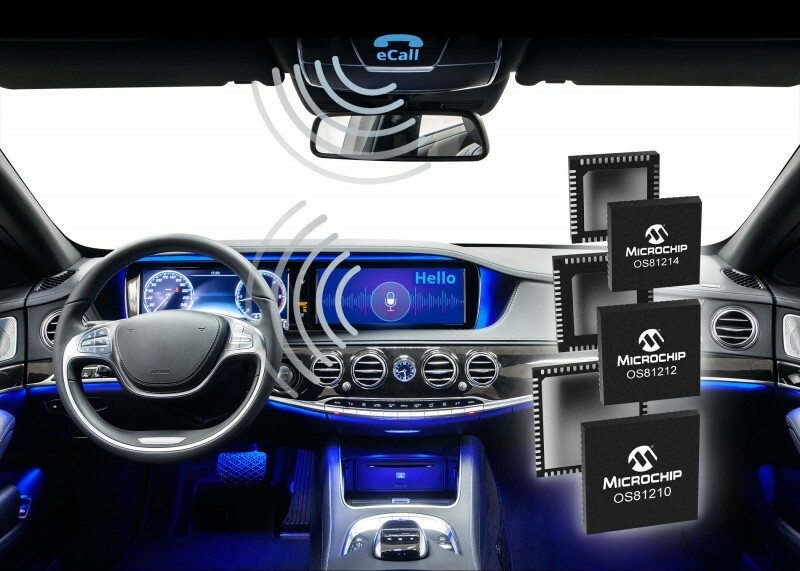 There are MIPI-CSI and parallel camera interfaces, as well as ESAI based audio. 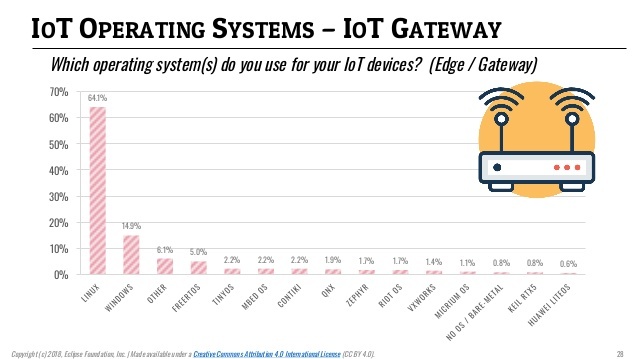 Other I/O available through the 280 pins found on its two banks of dual 70-pin connectors include USB 3.0, USB OTG, PCI/PCIe, and up to 10x I2C. You also get 2x UART, 3x CAN, 6x A/D, and single PWM, keypad, or MMC/SD/SDIO (but only if you choose the eMMC over NAND). 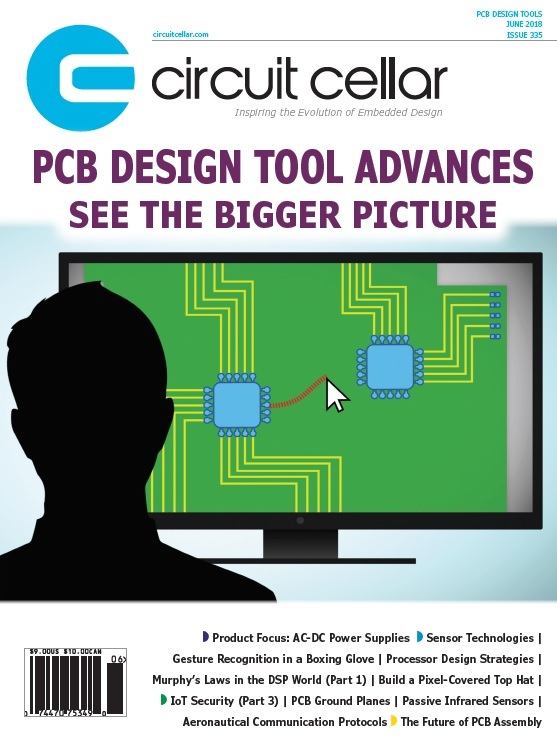 For SPI you get a choice of a single Octal connection or 2x “Quad SPI + 3 SPI” interfaces. 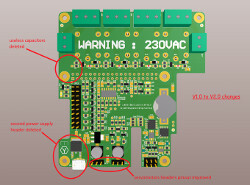 The 3.3 V module supports an RTC, and offers watchdog and tamper features. Like all the new Phytec modules, you get -40°C to 85°C support. 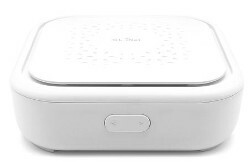 No details were available on the carrier shown in the image above. 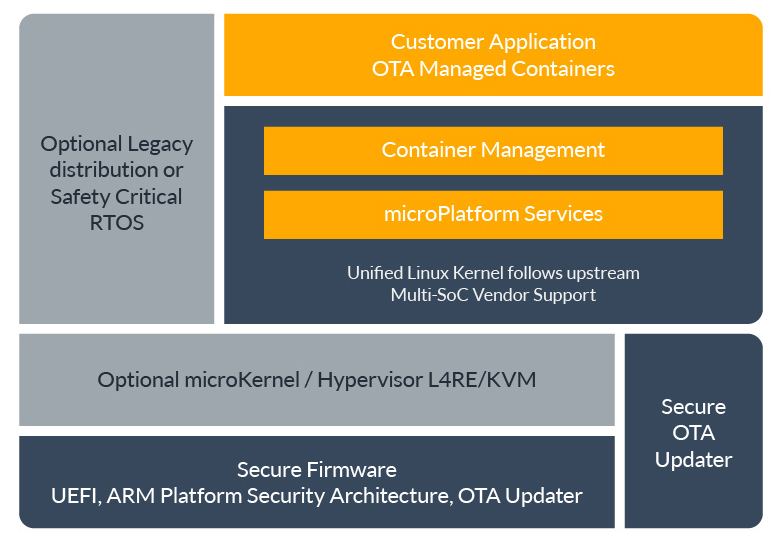 The 55 mm x 40 mm phyCORE-i.MX 8M joins a growing number of Linux-driven i.MX8M modules including Compulab’s CL-SOM-iMX8, Emcraft’s i.MX 8M SOM, Innocom’s WB10, Seco’s SM-C12, SolidRun’s i.MX8 SOM, and the smallest of the lot to date: Variscite’s 55 x 30mm DART-MX8M. 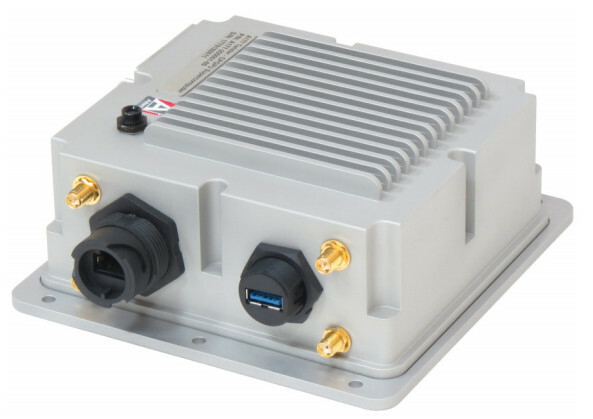 There are also plenty of SBCs to compete with the phyCORE-i.MX 8M-equipped phyBoard-Polaris SBC (see farther below), but like most of the COMs, most have yet to ship. 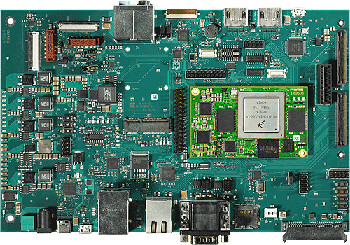 The phyCORE-i.MX 8M supports the NXP i.MX8M Quad and QuadLite, both with 4x Cortex-A53 cores, as well as the dual-core Dual. All are clocked to 1.5 GHz. 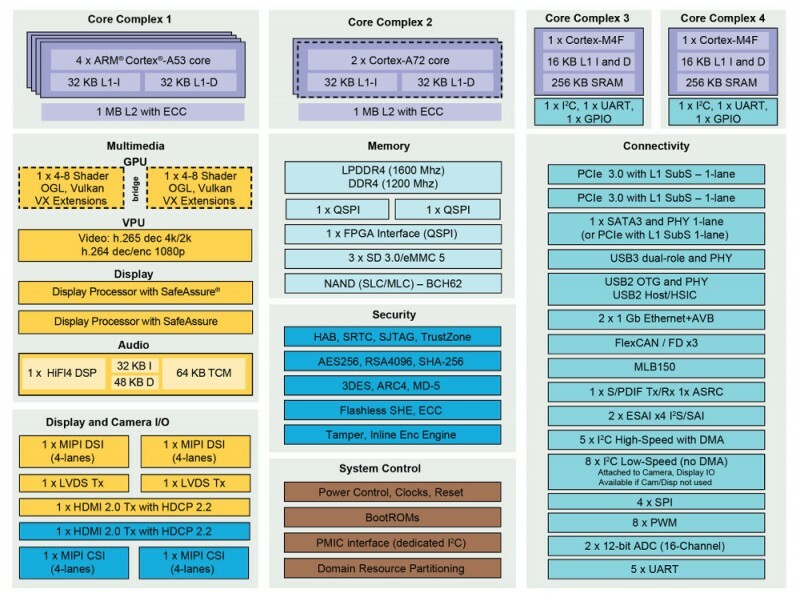 They all have 266MHz Cortex-M4F cores and Vivante GC7000Lite GPUs, but only the Quad and Dual models support 4Kp60, H.265, and VP9 video capabilities. 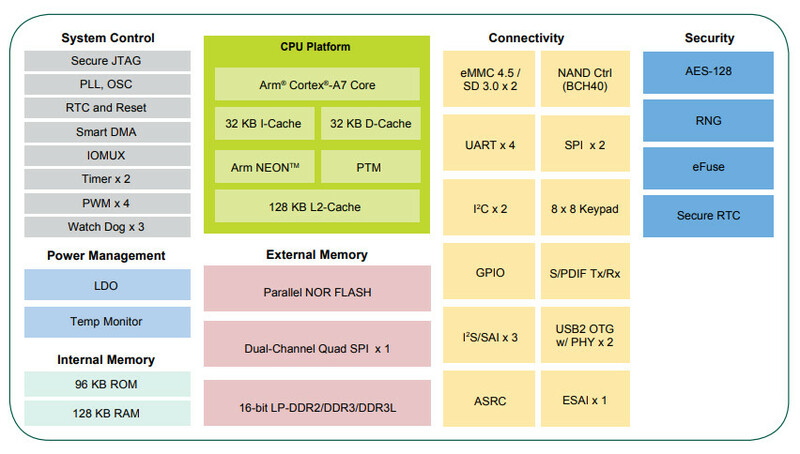 (NXP also has a Solo model that we have yet to see, which offers a single -A53 core, a Cortex-M4F, and a GC7000nanoUltra GPU. 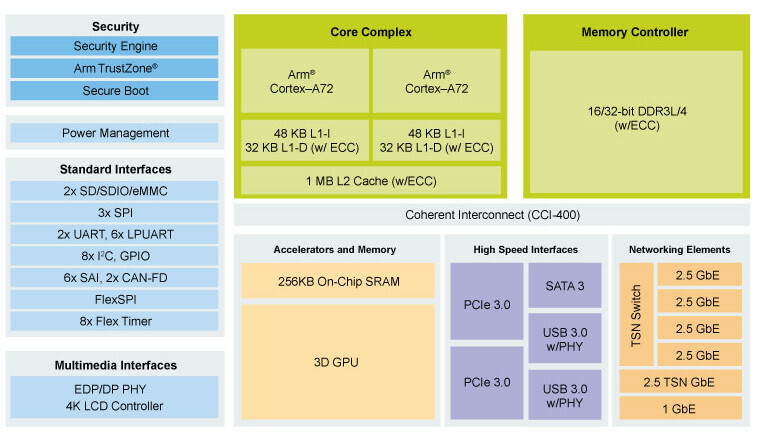 )In addition to the i.MX8M SoC, which offers “128 KB + 32 KB” RAM and the same crypto features found on the i.MX8X, the module ships with the same memory features as the phyCore-i.MX 8X except that it lacks the SPI flash. Once again, you get 512 MB to 4 GB of LPDDR4 RAM and either 128 MB to 1 GB NAND flash or 4 GB to 128 GB eMMC. 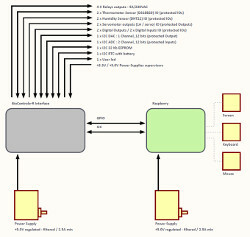 There is also SPI driven “Nand/QSPI” flash. 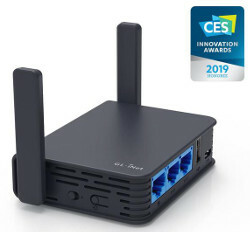 There’s a single GbE controller, and although not listed in the spec list, the product page says that precertified WiFi and Bluetooth BLE 4.2 are onboard and accompanied by antennas. 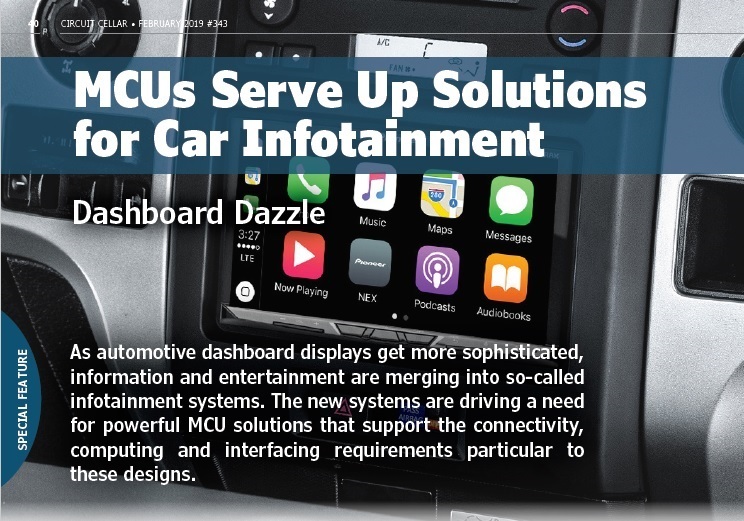 Multimedia support includes MIPI-DSI, HDMI 2.0, 2x MIPI-CSI, and up to 5x SAI audio. 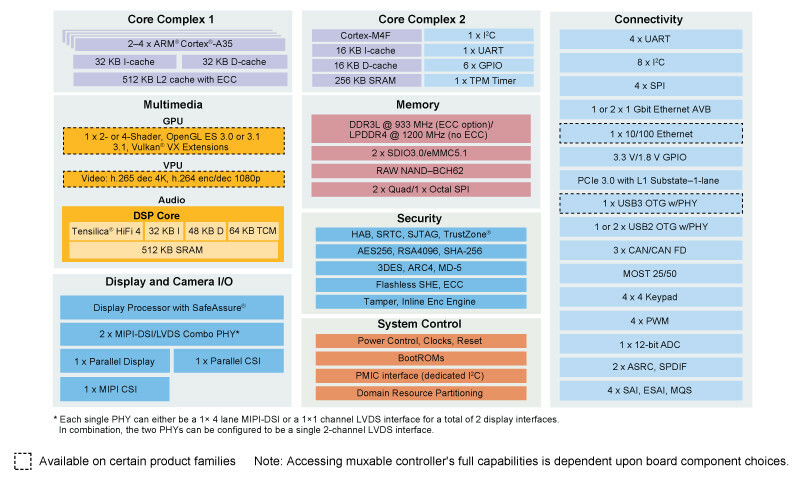 The block diagram also lists eDP, possibly as a replacement for HDMI. 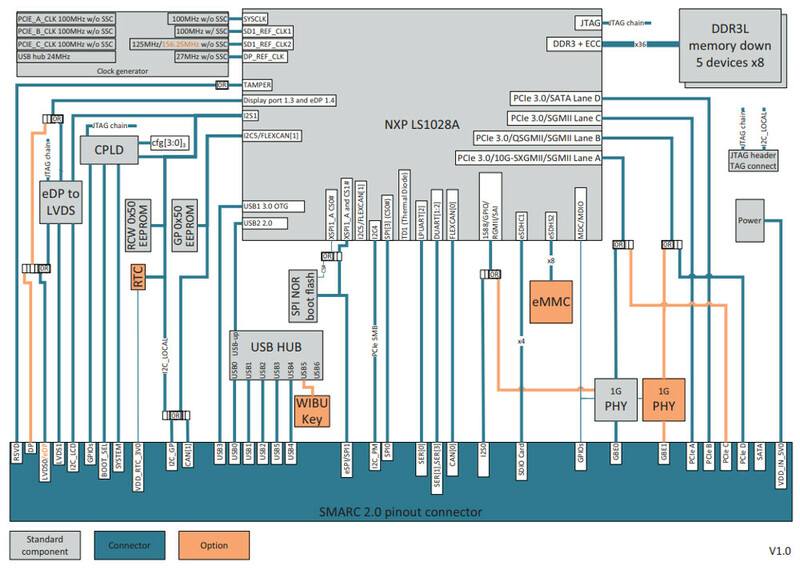 Other interfaces expressed via the dual 200-pin connectors include 2x USB 3.0, 4x UART, 4x I2C, 4x PWM, and single SDIO and PCI/PCIe connections. 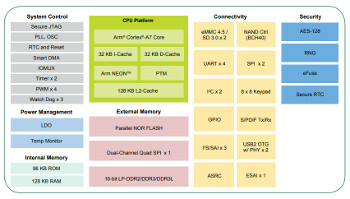 SPI support includes 2x SPI and the aforementioned Nand/QSPI. 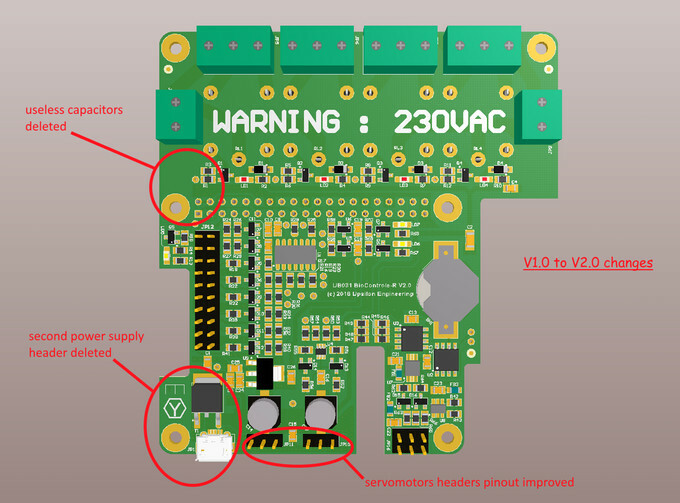 The 3.3V module supports an RTC, watchdog, and tamper protections. 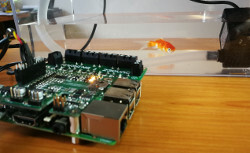 The phyCORE-i.MX 8M is also available soldered onto a carrier board that will be sold as a monolithic phyBoard-Polaris SBC. 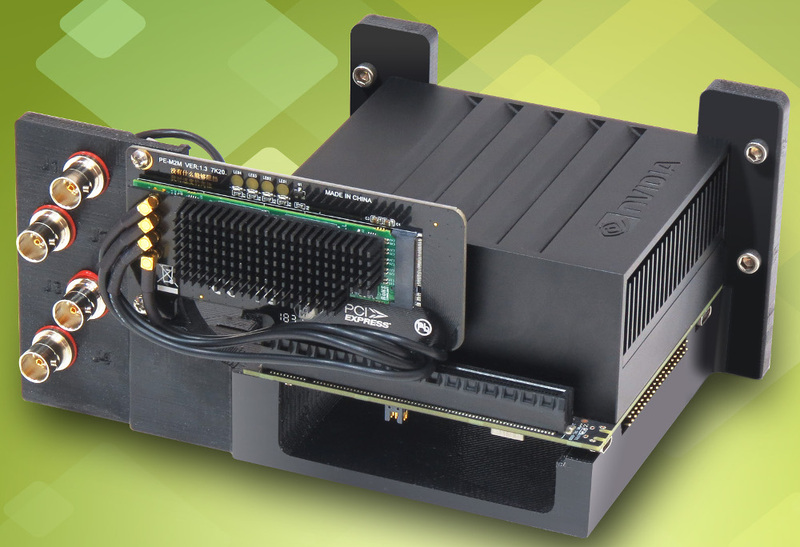 The 100 mm x 100 mm phyBoard-Polaris SBC features the Quad version of the phyCORE-i.MX 8M clocked to 1.3 GHz, loaded with 1 GB KPDDR4 and 8 GB eMMC. The SBC also adds a microSD slot. 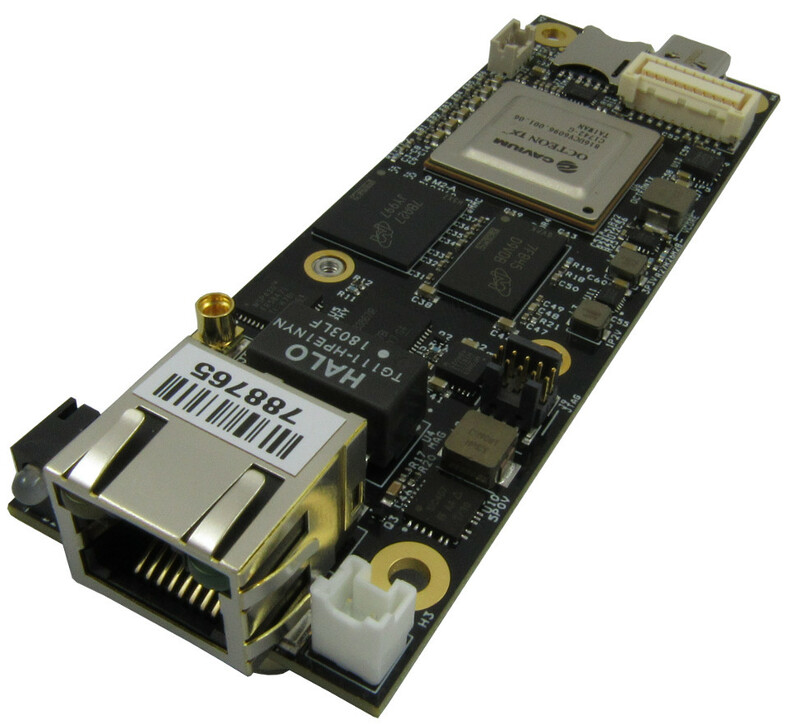 The phyBoard-Polaris SBC is further equipped with single GbE, USB 3.0 and USB OTG ports. 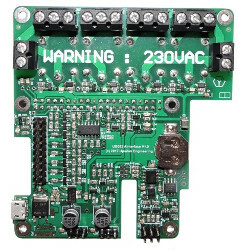 There’s also an RS-232 port and MIPI-DSI and SAID audio interfaces made available via A/V connectors. 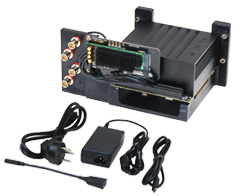 Dual MIPI-CSI interfaces are also onboard.A mini-PCIe slot and GPIO slot are available for expansion. 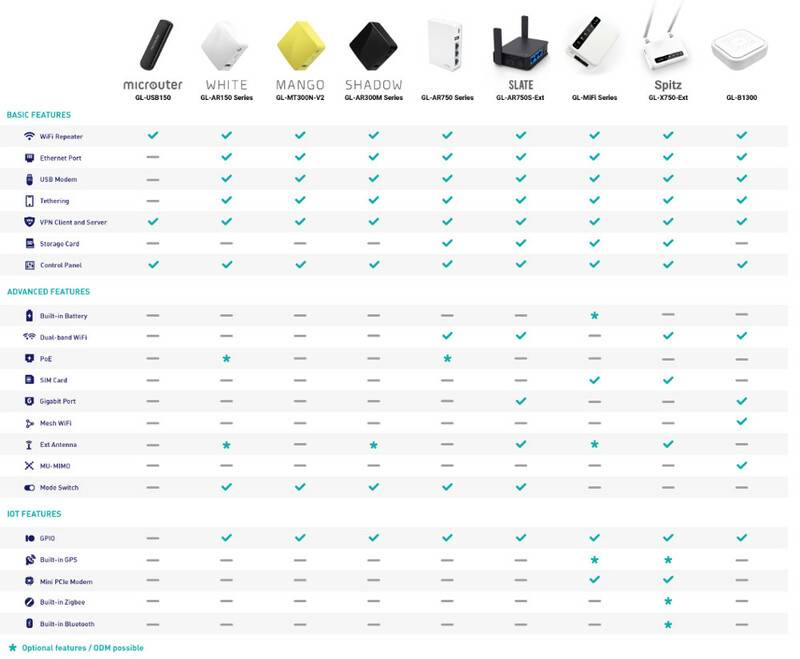 The latter includes SPI, UART, JTAG, NAND, USB, SPDIF and DIO. 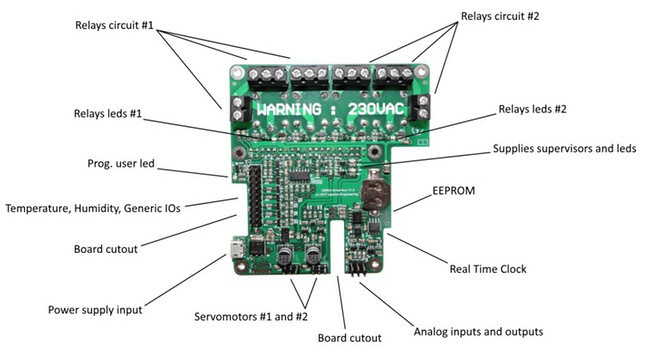 Other features include a reset button, RTC with coin cell, and JTAG via a debug adapter (PEB-EVAL). 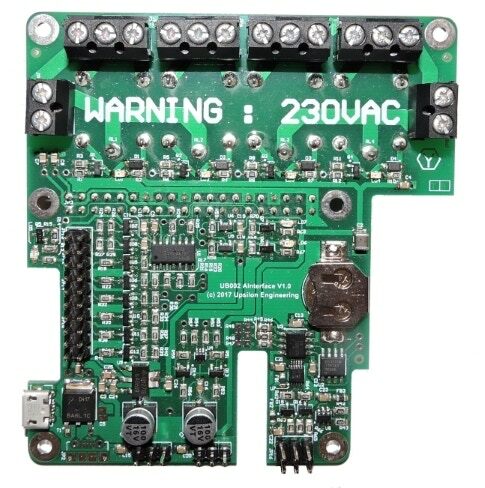 There’s a 12 V – 24 V input and adapter, and the board offers the same industrial temperature support as all the new Phytec modules. 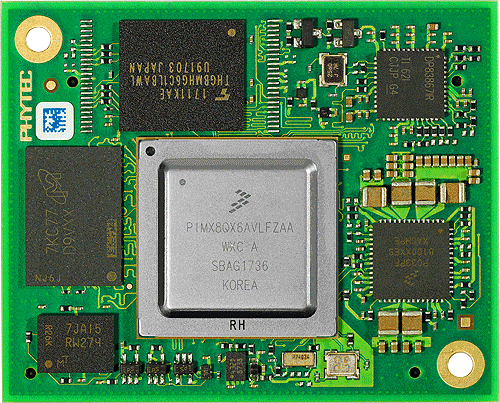 The phyCORE-i.MX 8, which is said to be “ideal for image and speech recognition,” is the third module we’ve seen to support NXP’s top-of-the-line, 64-bit i.MX8 series. The module supports all three flavors of i.MX8 while the other two COMs we’ve seen have been limited to the high-end QuadMax: Toradex’s Apalis iMX8 and iWave’s iW-RainboW-G27M. 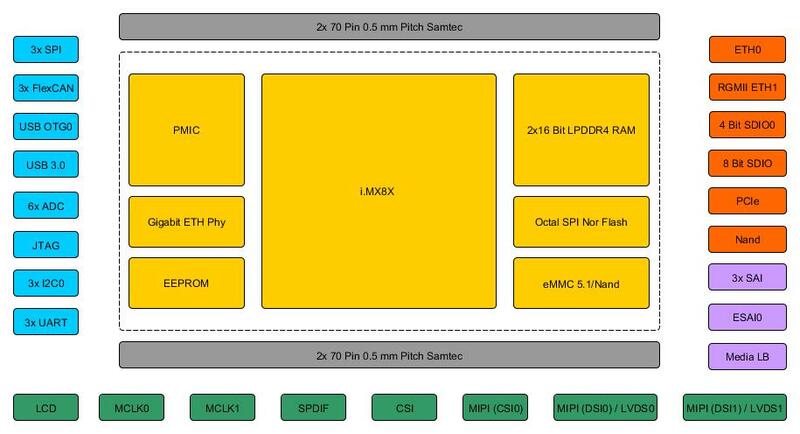 Like Rockchip’s RK3399, NXP’s hexa-core i.MX8 QuadMax features dual high-end Cortex-A72 cores clocked to up to 1.6 GHz plus four Cortex-A53 cores. 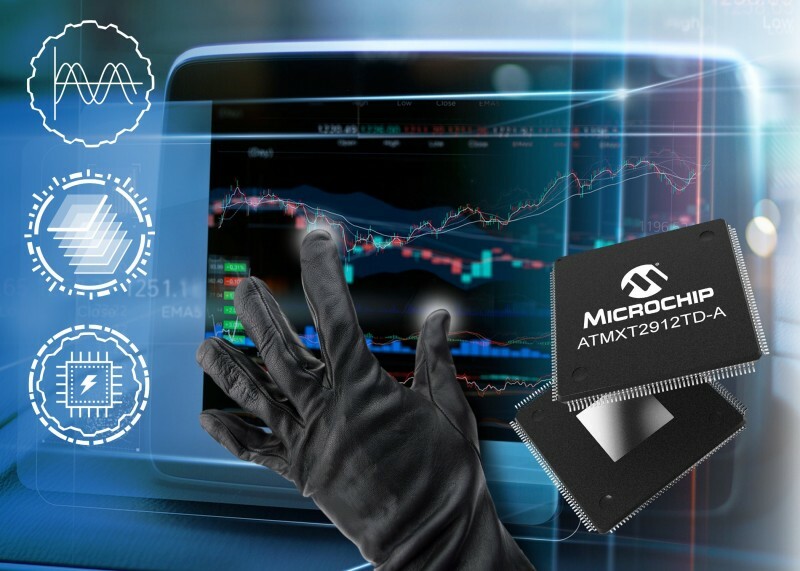 The i.MX8 QuadPlus design is the same, but with only one Cortex-A72 core, and the quad has no -A72 cores.All three i.MX8 models provide two Cortex-M4F cores for real-time processing, a Tensilica HiFi 4 DSP, and two Vivante GC7000LiteXS/VX GPUs. The SoC’s “full-chip hardware-based virtualization, resource partitioning and split GPU and display architecture enable safe and isolated execution of multiple systems on one processor,” says Phytec. The 73 mm x 45 mm phyCORE-i.MX 8 supports up to 8 GB LPDDR4 RAM, according to the product page highlights list, while the spec list itself says 1 GB to 64 GB. 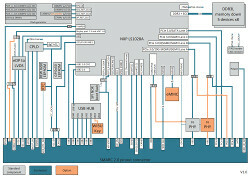 Like the phyCORE-i.MX 8X, the module provides 64 MB to 256 MB of Micron Octal SPI/DualSPI flash. There’s no NAND option, but you get 4 GB to 128 GB eMMC. The phyCORE-i.MX 8 is further equipped with I/O including 2x UART, 2x CAN, 2x MMC/SD/SDIO, 8x A/D, up to 19x I2C, and a PWM interface. 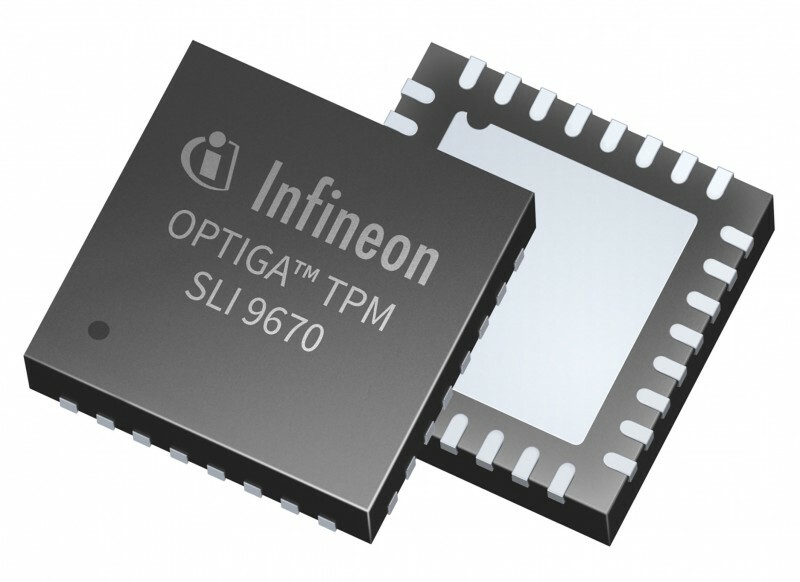 For SPI, you get “up to 4x + 1x QSPI.” The module supports an RTC and offers industrial temperature support. 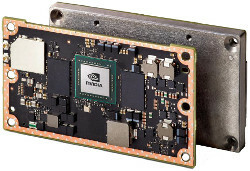 In addition to the unnamed carrier board for the phyCORE-i.MX 8 module shown above, Phytec plans to produce a “Machine Vision and Camera kit” to exploit i.MX8 multimedia features including the VPU, the Vivante GPU’s Vulkan and OGL support, and interfaces including MIPI-DSI, MIPI-CSI, HDMI, and LVDS. 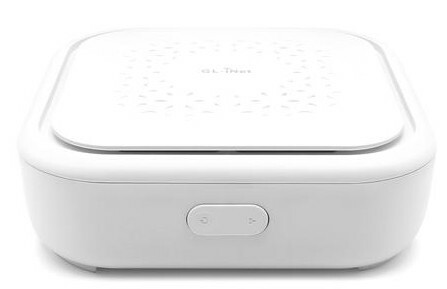 In addition, the company will offer rapid prototyping services for customizing customer-specific hardware I/O platforms.Finally, Phytec is planning to develop a smaller, Pico-ITX form factor SBC based on the i.MX8 SoC, and it’s taking a novel approach to do so. 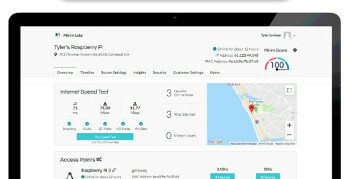 The company has launched a Cre-8 community which intends to crowdsource the SBC. The company is seeking developers to join this alpha-stage project to contribute ideas. 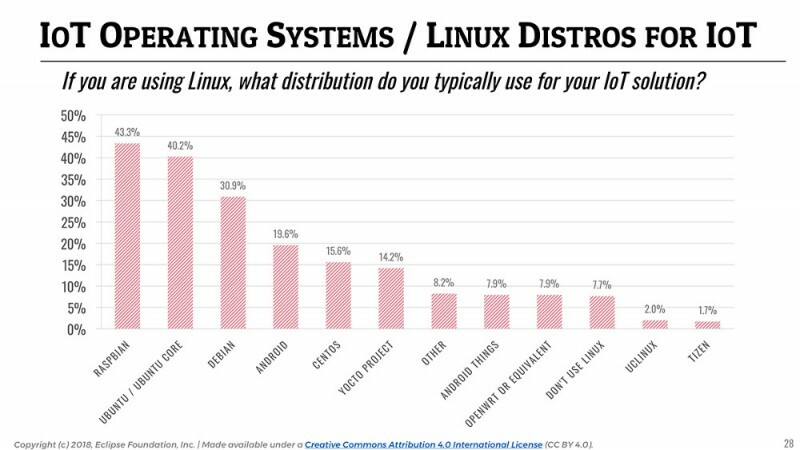 We saw no promises of open source hardware support, however. [As of March 29] No availability information was provided for the phyCORE-i.MX 8X, phyCORE-i.MX 8M, or phyCORE-i.MX 8 modules, but the phyCORE-i.MX 8M-based phyBoard-Polaris is due in the third quarter. More information may be found in Phytec’s phyCORE-i.MX 8X, phyCORE-i.MX 8M, and phyCORE-i.MX 8 product pages as well as the phyBoard-Polaris SBC product page. 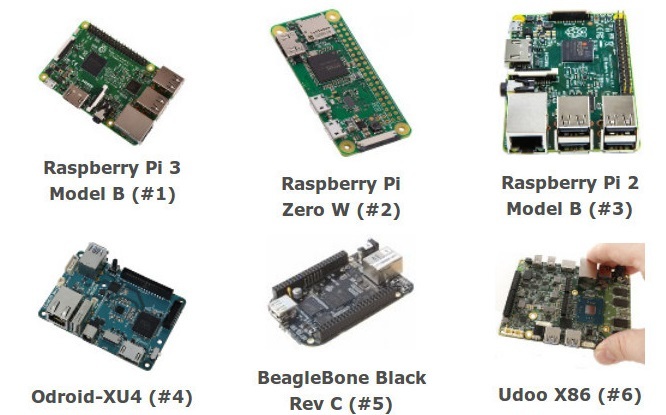 More on development kits for all these boards may be found here. 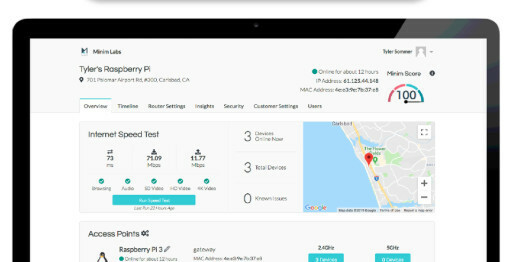 This article originally appeared on LinuxGizmos.com on March 29. Phytec issue a Press Release announcing these products on April 19.